A Texas-based author shares her family history and travelogues. Osborn (Where We Are Now: Short Stories, 2015, etc.) 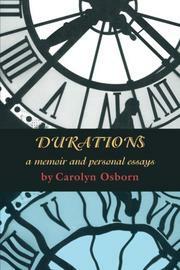 divides the book into two sections: “Durations, a Memoir” and “Essays.” In the first section, the author runs through her childhood memories and family history in comprehensive and often dry detail. We learn about the numerous times she moved as a child, which aunts and uncles took her and her brother in while their father was in the military during World War II, and the rapid disappearance of their mother into an institution for a condition that was rarely discussed. “Of all the secrets in our family,” she writes, “the greatest one was my mother’s condition.” Only as an adult was Osborn able to piece together a more complete picture of her mother’s schizophrenia, which required hospitalization. The author also discusses her struggles during grade school and high school, experiences that are common to most children with divorced or separated parents. Her new stepmother also features in this section, a woman who readily embraced her new stepchildren. Unfortunately, this first section consistently bogs down in slow-moving prose and the kinds of innocuous details that will appeal mainly to the author’s family and friends. Readers are advised to skip to the second section of the book, in which Osborn presents more refreshing tales of raising cattle on a dry patch of land in Texas, seeking out the blue-footed booby in the Galápagos Islands, and wandering the desolate landscape of the Scotland Highlands in search of family ties. In her travel essays, the author provides adequately colorful descriptions of the people and their surroundings, whether it's a security guard with an AK-47 in front of the pyramids in Egypt or her father hunting doves in Texas. Monotonous personal history coupled with interesting essays on world travel.